Aces Of Trades - The article from the Newark Advocate discusses Dr. Laing’s, background, her first trip to Haiti, the need for permanent medical facilities in rural Haiti and the origins of HAM. I personally am related to 2 victims of violence during the lock down. A male cousin was shot and died, and a female cousin was shot and is fortunately alive. She was part of a group of 17 people who were shot in Petit Goave. For the first time I spent 10 consecutive days at home working on the computer and doing online home work with my children, who could not go to school. Their school sent online work home by google Classroom. To me, it was like a prison because I could not do the work I am used to doing on a daily basic, and we had no Idea when the crisis would stop. But we did a lot of work on the clinic payroll and small fees schedules and we were able to communicate with the local clinic staff and the USA HAM directors. It is important to mention that the clinic was opened with some of the closest local staff and some patients, less than 15 a day, were seen by our head nurse. Two deliveries were done by our midwives, and clean water was given freely to the community, who’s members could not go leave Dumay to buy or sell anything. After more than 10 days of political crises that put all the country on lock down, the humanitarian crises continues. I personally spent 12 hours in a long line to purchase propane and water, which cost double the usual price. Medicine and other needed supplies have become more expensive and difficult to find, and people are still afraid and stressed. We have the feeling that the conflict is not solved and tomorrow is not certain. In reality Haiti is the great victim. I think the situation after the crises will be worse because nothing is solved. We will have many more recurrent crises, maybe some worse than this one. So, as humanitarian actors, NGO’s like HAM, must prepare a vigorous response if we want to continue to support the most underserved and vulnerable people who very often have no other alternatives. 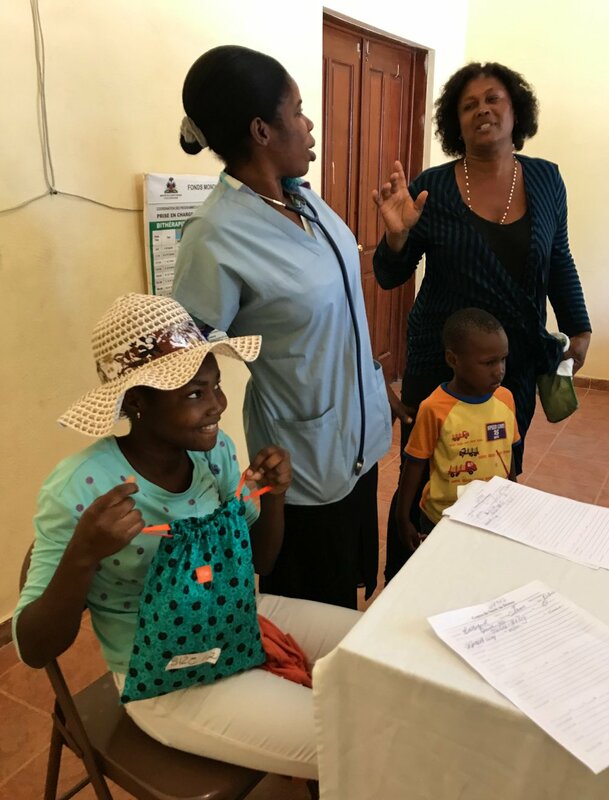 January 13, 2019, Dr. Tracee, Dr. Leslie and Paul began the first of a 2 week long team trip to Haiti. The first week we worked in the primary care clinic, saw home bound patients and Dr. Leslie assisted Dr. Jacques in surgery. We also prepared for the 3rd annual “Go Crazy do Good” Dr. Brian Stahl eye surgery team that descended on the clinic on Jan. 19th. In 4 days, the team completed 104 eye surgeries; 94 cataract surgeries, 8 laser surgeries, and 2 for traumatic injuries. Dr. Brian and his team have earned the trust and love of the Dumay community and beyond after 3 years of successful sight giving surgeries. Power at the clinic worked beautifully, with 2 autoclaves, operating room air conditioning and lots of surgery equipment running – Thank you Keith and Aaron. November and December 2018; Keith and Aaron Hare spent a very successful week in Haiti with Charles, and Johny to repair the solar power and battery system in the Centre de Sante de Dumay. They installed 8 new batteries and a new Whizbang Jr! On November 17, 2018, Dr. Tracee joined our friend and supporter Rita Peterson who sponsored her annual quilt silent auction in conjunction with the Keystone Church Festival of Hope in Seattle, WA. It featured 5 beautiful quilts all made by Mona Hassan, and raised $3,313. Thank You Rita! Susan Palleschi, Dr. Leslie, Dr. Tracee worked with our Haiti team. Susan and Charles made the trek to Demier for a mobile eye clinic. They fitted patients with readers and glasses for distant vision as needed. They also screened for cataract patients to refer for surgery in January. Leslie and Tracee saw an increased number of children with respiratory infections, along with the usual complaints in the primary care clinic. We helped the midwives care for a pregnant patient having an acute asthma attack. We struggled with the clinic power system and got by with our LUCI lights! On August 18, 2018 Bien Aime Flaure Marie delivered the first baby in our safe birthing program that began seeing patients in March 2018. Marie Flaure is seen here holding the healthy baby girl. Things in Haiti slow down in the summer. School is out and it’s very, very, hot. Tracee was the USA portion of the team, along with some help from others back home via phone and internet. Jacques, Charles, Tracee, and clinic staff spent time evaluating each program and coming up with ideas for improvement. This is Dr. Jacques first month to devote his full attention to the clinic since graduating from his MBA program, so this review was particularly timely. We continue to give the safe birthing program extra time and support since it is one of our newest programs. This trip we introduced the “Days for Girls” program with the help of Amesville - New England Parish. daysforgirls.org seeks to supply girls with washable hygiene kits, so they don’t miss school while on their period. We also began a program to distribute LUCI lights to school children at the Charles Solomon school in Port-de-Paix. In October we hope to extend the program into Demier. Nurse Ruth, and her daughter with a Days for Girls kit. Nurse Midwife, Marie Fleur with supplies donated by Dr Becky Stilson. Dr. Tracee worked with our Haiti team. She introduced a new program, “Days for Girls,” spear headed by Catherine Hare of the Amesville-New England Parish in southern Ohio. The program aims to keep girls active and in school all month long by supplying them with washable hygiene supplies. Volunteers in Ohio stitch the hygiene kits and HAM brings them to Dumay to be distributed to girls at the Centre de Sante de Dumay. As we do every 3 months, Dr. Tracee cared for home bound patients in the Dumay area, by visiting each one with Clerdomy.